Melt the chocolate and butter in the bowl over simmering water. Stir in the vanilla and Kahlua. 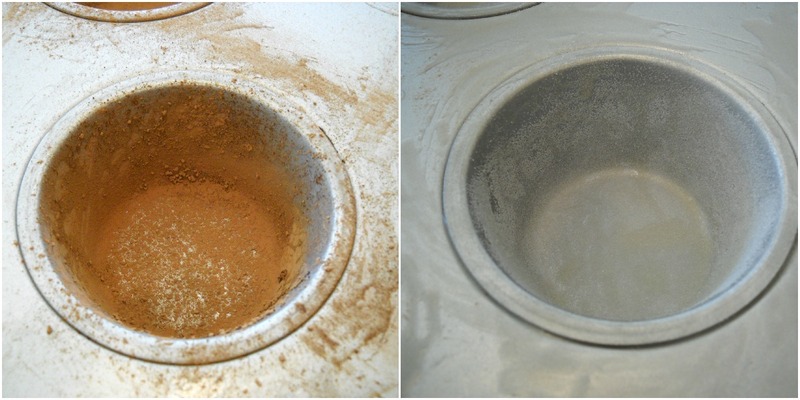 Remove the bowl from the heat and let cool to room temperature. In a small bowl, sift together the sugar, flour and salt. Sift these again into the chocolate mixture. With the whisk attachment, mix well. Beating in each egg before adding the next egg. Once all the eggs are added, beat on medium high for about 4 minutes until the mixture is creamy and lighter in color. Cover the bowl with plastic wrap and refrigerate for 1 hour. Meanwhile, coat each muffin cup (and top lip) with the melted butter using a brush. Let the butter slightly harden. Place a small amount of cocoa or superfine sugar in each muffin cup and shake to coat. Shake off excess. Set aside. 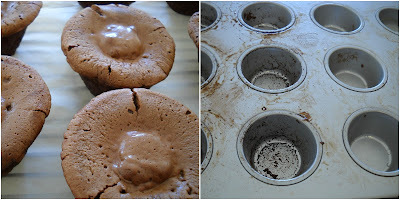 Remove batter from the refrigerator and using a scoop (I used a #10 scoop, which is 3.2 oz) portion out evenly into the prepared muffin cups. Fill in any empty muffin cups with water (half way up). This allows for even baking. Bake for 10 minutes (add one more minute if needed). The outsides should be puffy and cake-like and the centers should still be "liquidy." Remove to a wire rack and cool in the pan for 5 minutes. Make the Chocolate Kahlua Ganache by combining the chocolate, vanilla and Kahlua in a medium bowl. Heat the cream in the microwave until just bubbly (but do not bring to a rolling boil or you will burn the milk and chocolate). Pour the hot cream over the chocolate mixture. Let sit a few minutes to allow chocolate to melt. Stir together for 2 minutes until completely smooth and glossy. Let sit a few minutes to thicken. 1. In a bowl of a stand mixer, combine the semisweet chocolate and butter. Place over a saucepan of simmering water. Melt the chocolate and butter in the bowl. Stir in the vanilla and Kahlua. 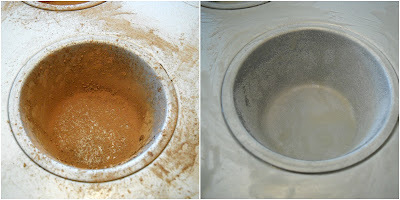 Remove the bowl from the heat and let cool to room temperature. 2. In a small bowl, sift together the sugar, flour and salt. Sift these again into the chocolate mixture. With the whisk attachment, mix well. 3. Add the eggs, one at a time, fully beating in each egg before adding the next egg. Once all the eggs are added, beat on medium high for about 4 minutes until the mixture is creamy and lighter in color. Cover the bowl with plastic wrap and refrigerate for 1 hour. 4. Meanwhile, coat each muffin cup with the melted butter using a brush. Let the butter slightly harden. 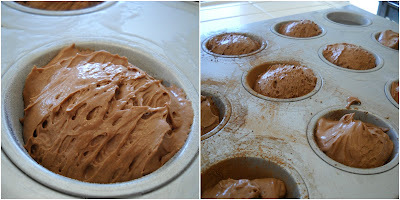 Place a small amount of cocoa or superfine sugar in each muffin cup and shake to coat. Shake off excess. Set aside. 5. Remove batter from the refrigerator and using a scoop (I used a #10 scoop, which is 3.2 oz) portion out evenly into the prepared muffin cups. 6. Bake for 10 minutes (add one more minute if needed). The outsides should be puffy and cake-like and the centers should still be liquidy. Remove to a wire rack and cool in the pan for 5 minutes. 7. Gently remove from the pan, keeping upright. Let cool for 5 more minutes until ready to spoon on the ganache. 1. 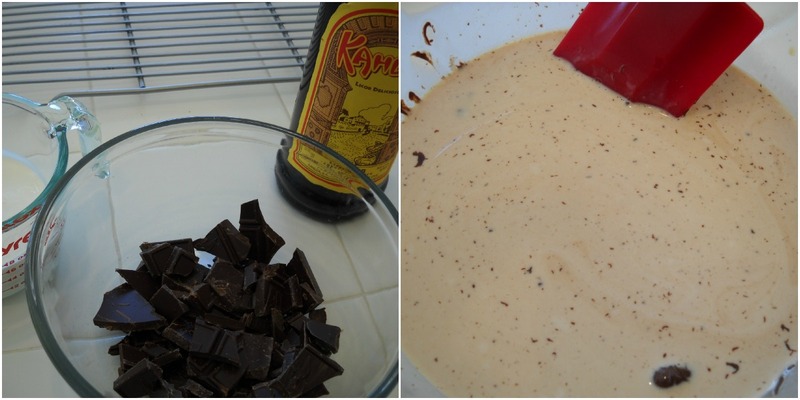 In a medium bowl, combine the chocolate, vanilla and Kahlua. 2. Measure the cream into a microwave-safe measuring cup. Heat on high for 30-45 seconds or until just bubbly (but do not bring to a rolling boil or you will burn the milk and chocolate). 3. Pour the hot cream over the chocolate mixture. Let sit a few minutes to allow chocolate to melt. 4. Stir together for 2 minutes until completely smooth and glossy. Let sit a few minutes to thicken. Spoon over cakes that have been turned upside down. Let ganache run down sides. Serve warm with vanilla ice cream. 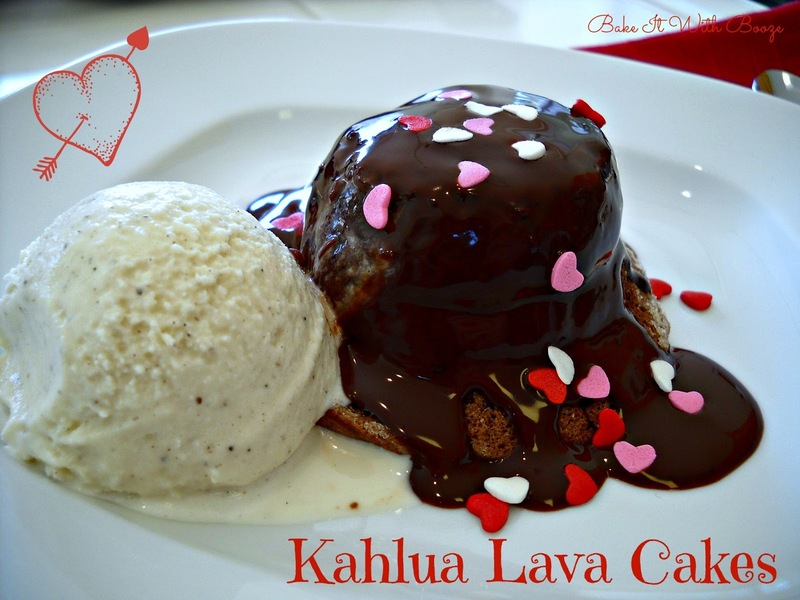 Note: These lava cakes can be refrigerated and reheated just before serving. Heat in a microwave for 30 seconds on half-power until warm and just soft to the touch. 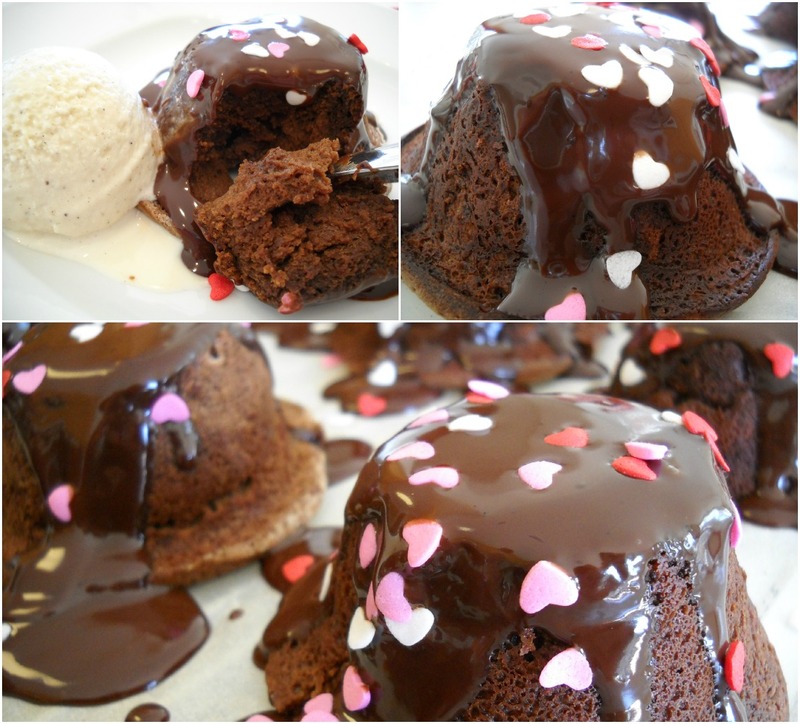 A heavenly looking lava cake! They really were little chocolate clouds...So, yes! Heavenly. :) Thanks for stopping by! Oh my goodness, these look delicious! I'm going to have to make some lava cakes! I made these for dinner guests, and they LOVED them. It was pretty easy too! I swear to heaven above I was drooling already before the page even loaded. I need this. NOW.